In a region of the country that has a multitude of recreational activities, the 2018 Ford Explorer at Friendly Ford answers the call for outdoor enthusiasts. Now, the Explorer features a new grille, seating up to seven people, hands-free liftgate, a choice of three engines and the responsive performance of SYNC 3 voice-activated technology. Engines in the ’18 Explorer include the 3.5-liter VCT V-6 with 290 horsepower, the 2.3-liter Ecoboost with 280 horsepower and the 3.5-liter Ecoboost best-in-class V-6 with 365 horsepower. Fuel mileage ratings include a combined 20 mph in the V-6, combined 22 in the 2.3-liter and combined 18 in the 3.5-liter Ecoboost. Suspension packages include Normal for everyday driving on wet or dry paved roads; Mud/Rut for backgrounds that can get muddy after a good monsoon rainstorm; Sand, which covers the day at the beach or a trip to Dumont Dunes southwest of Las Vegas; and Snow, Gravel, Grass that covers the spectrums including winter snow conditions at Lee Canyon or an assortment of challenges in Utah. 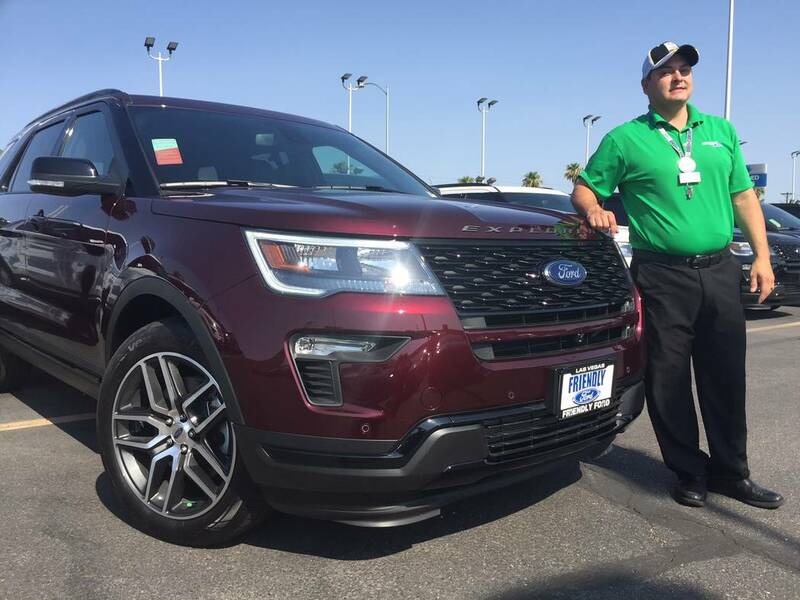 Friendly Ford sales consultant Joe Christensen said the ’18 Explorer is the most popular sport utility vehicle in the market and the hottest selling SUV in the country. Christensen said the Explorer meets the wants and needs of various buyers. “The buyer profile includes large families and people who enjoy hiking, camping and other outdoor activities,” he said. Located at 660 N. Decatur Blvd., Friendly Ford is an 18-time winner of the President’s Award, Ford’s highest single honor for customer satisfaction. The dealership recently celebrated its 48th anniversary. Further information can be found by calling 702-870-7221 or by visiting www.friendlyfordlv.com.